Green Gram/Green moong dal/Pachai payaru is a healthy legume we include in our diet for its goodness. 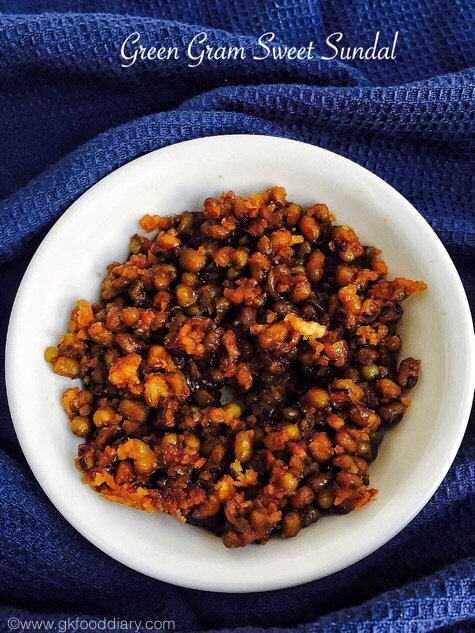 Sundal is a special dish made for Navaratri festival. It also served as a evening snack. We make both sweet and savory version of sundal with green gram. I like both the versions each one unique on its own way. I will be posting the savory version of green gram sundal in near future. This marks my 100th post and wanted to post something sweet for this special post. 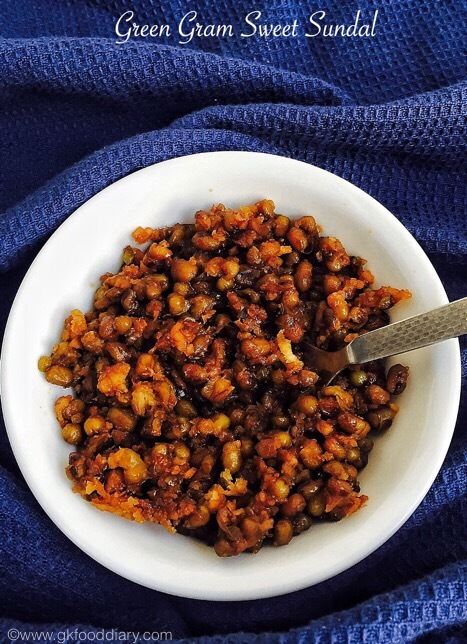 But I couldn’t get time to post anything big, so posting this easy sweet sundal recipe. 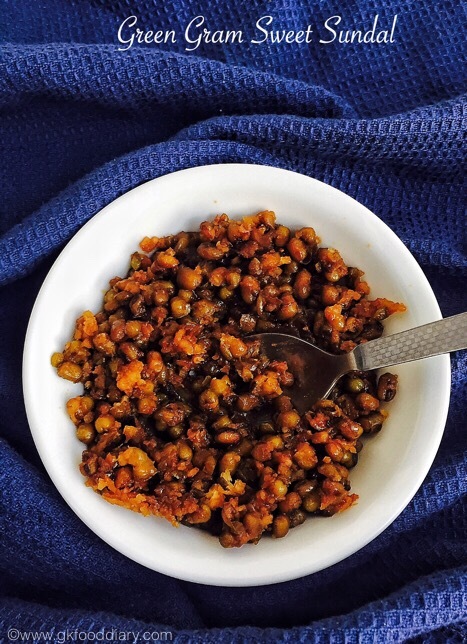 This green gram sweet sundal is a quick and easy sweet sundal recipe made with jaggery. 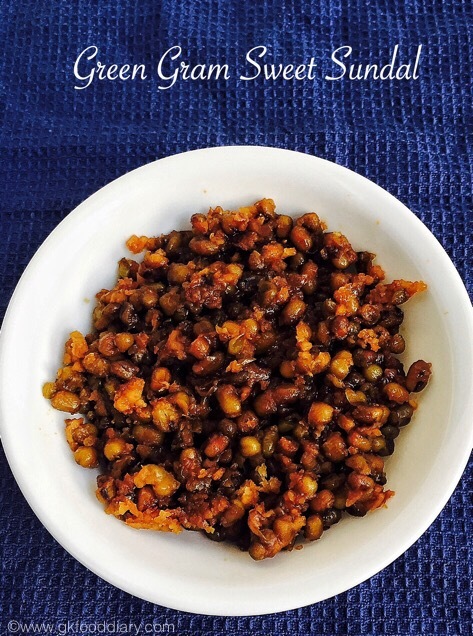 Kids will love this sweet sundal recipe for its sweet taste and it is one of the best way to include legumes in their diet. Here is how to do green gram sweet sundal. 1. 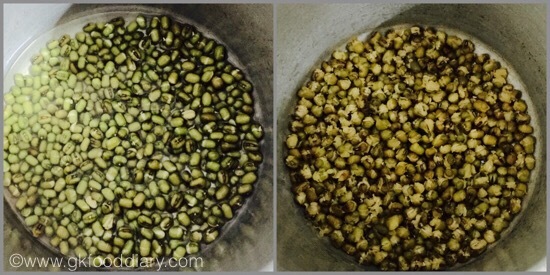 Soak the green gram in water overnight or at least 7 hours. After soaking, pressure cook it for 2 whistles in medium flame. Make sure the green gram don’t become mushy. Open the cooker once pressure released by itself. Set aside. 1. Take jaggery powder in a sauce pan with water till it immersed level. 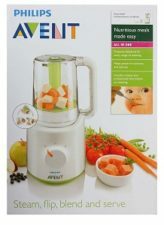 Heat it until it dissolves completely. 2. 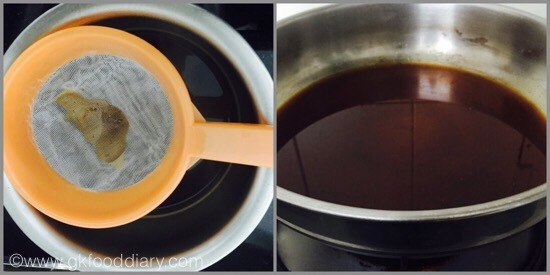 Strain the jaggery water using a strainer to remove the impurities present in jaggery. Then start reheating the jaggery water in a pan with medium flame. 3. Heat the jaggery until bubbles start to appear and slightly thick. 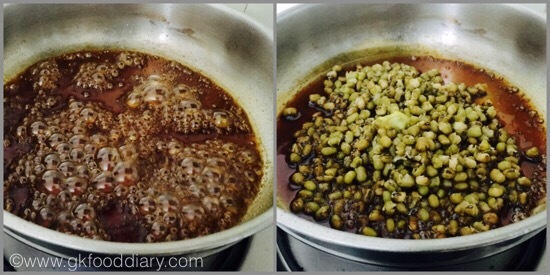 Now add the pressure cooked green gram along with ghee and mix slowly with jaggery. Mix it till becomes dry and all jaggery is absorbed. 4. 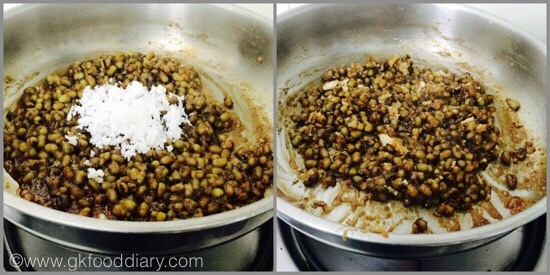 Once the jaggery is absorbed well by the green gram, add grated coconut and give a quick stir. Fry it for 2 minutes and switch off the flame once done. Sweet green gram sundal is ready to serve. 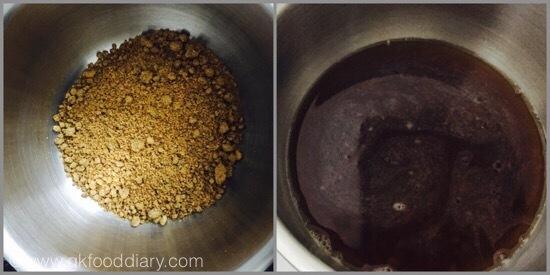 Mix well until jaggery is completely absorbed otherwise the sundal will be moist. No need to check jaggery consistency but make sure the jaggery is slightly thick before you add green gram. The Sundal should be soft but not too mushy. You could add coconut pieces to this green gram sundal instead of grated coconut.